Happy Mom’s Day!!! We had such a fun time celebrating our Mom’s today. It started off with another road trip up to see my parents. We met them to watch DATE NIGHT, have lunch and do a little shopping. Then, it was back home for a Lazy Chicken Enchilada Fiesta with The Husband’s mom. I wasn’t hungry at all for breakfast (rare for me), but, I ALWAYS believe in having something to break the “fast” from the night before and get your metabolism revving. After we left the house and were on the road my stomach decided it was time to get hungry. I snacked on some WW Rosemary & Olive Oil Pretzel Thins (2 pts) to tied me over through the movie. We had all decided to go to Jack’s Urban Eats for their AMAZING salads, but, they were closed for Mothers Day 🙁 Booo! Our second choice was BJ’s Brewery and it did not disappoint! Everything on the menu sounded AWESOME. 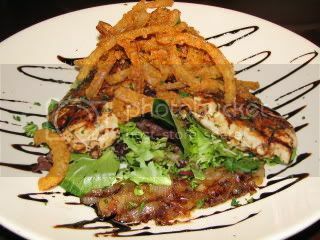 I debated having one of everything :D, but, when I read the description of the Balsamic Glazed Chicken over Mixed Greens I knew I had to get it. This was probably one of the most amazing dishes I’ve ever had. I ate 1 chicken breast, all the greens and onions (two types – marinated in balsamic & crispy ones) plus about pretty much all of my white cheddar mashed potatoes. I plan on re-creating this salad this week – it was THAT good! To make life easier, I prepared everything last night for dinner with The Husband’s mom. I personally think the type of enchilada sauce you pick makes a HUGE difference in the flavor. This is my FAVORITE one and it’s 110% worth paying $1 or $2 more. You can use flour or corn tortillas, but, I prefer corn because their stats are better and the flavor of these Green Chili Corn Tortillas ROCK! ALWAYS buy and finely shred your own LOW FAT cheese. It melts better and it goes further. Start off by boiling your chicken…it allows the chicken to cook but keeps it super moist. At the same time, I caramelize a little onion and garlic. Shred your chicken and add your onion mixture, sea salt and black pepper. Drizzle a little enchilada sauce to add even more flavor. Start out with a light layer of enchilada sauce, about 1/3 cup. 1/3 of your triangle tortillas and half the chicken mixture. Top with 1/3 of your cheese and olives. Another 1/3 c of enchilada sauce drizzled. Repeat again with your top layer being sauce, cheese and olives. Bake at 400 degrees for about 25 minutes until heated through and the cheese is melted. Cut into 8 slices and dig in!!! Only 5 points a serving!!! You can top it with FF Sour Cream or Greek Yogurt, Guacamole, salsa and/or any of your favorite toppings. Side Salad with Newman’s Own Light Lime Vinaigrette. Glad someone else insists on having breakfast even if they aren’t hungry! SO many people tell me, “Well If I’m not hungry, I shouldn’t be eating anyway!” No. wrong. in this one instance. Your body needs fuel after 8 hours without it!! Those enchiladas look awesome, I love enchies- I made some last week! Those chicken enchiladas looks great – I’ve never had enchiladas actually but they always sound so good. I need to change that. The casserole looks delicious – I am definitely adding it to my to-try list. I agree with you about the enchilada sauce though I have a hard time finding that brand. There was another brand I liked a lot but can’t find anymore either, but I don’t remember the name. I like the TJ’s enchilada sauce pretty well but if I haven’t been to TJ’s lately I will use the Old El Paso that I can find everywhere and just doctor it with a little chipotle powder and maybe some onion/garlic powder to taste. YUM! i’m sure it was amazing!! 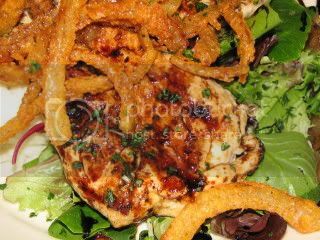 Do you know the recipe for the balsamic glaze marinade? Oh my this if my fav dish from BJs ever!! I love it! Any tips to re create that will make my day!